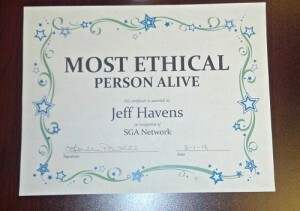 As of today, I now have a framed certificate on my wall proclaiming me the Most Ethical Person Alive. I got it while filming some videos about corporate ethics with a company in Dallas, and it’s impossible for me to overstate to you how hilarious it is that I now have this thing. If they only knew some of the things I did in college, they probably wouldn’t have given it to me. But that’s beside the point. Sometimes we get desperate, and college people are notorious for being willing to do pretty much anything for a $20 dare. The point is, I’ve just spent several weeks of my life researching and then writing videos about how to conduct yourself in an ethical, upstanding, and otherwise moral way. Which means that I’m now going to tell you several ways that you can screw it all up. Enjoy! Take Stuff Without Asking! A lot of people call this ‘stealing,’ but I like it call it ‘borrowing for a really, really, really, really long time.’ The whole reason your company has a supply closet is because they know that you need supplies, and they want you to have them. Besides, you know how sometimes you go to your parents’ house and help them unclutter things so that they don’t have to worry about all that junk mucking up the garage? Well, it’s pretty much the same thing with your company. Except they plan on using all that stuff someday. And they didn’t ask for your help. And all those things are possibly worth a lot of money. And I’m going to stop right there. Touch People! There’s really only one place where it’s acceptable to touch other people at work, and that’s their hands – but not both at once, since that would be creepy. (Don’t believe me? Give someone a long two-handed handshake and see how happy they look.) Which means you should touch people everywhere except for their hands. Possible options include giving them massages, rubbing their faces, and smelling their hair. See how many you can get away with before you get called into HR for your probably-way-smaller-than-it-would-have-been-otherwise severance package! So enjoy, my loyal readers! I’m going to go now and bask in the glow of my overwhelming morality. But don’t worry! Next week I promise I’ll be back to my normally normal self. Until then, strive for greatness – but mediocrity is comfortable, too.